That’s the number of #SupportTheReport postcards handed out and signed to date by students, faculty and staff across the University of Toronto community to send to federal Science Minister Kirsty Duncan. The postcards are helping amplify efforts across Canada to encourage the federal government to act on the 35 recommendations made by Canada’s Fundamental Science Review, including a $1.3-billion boost in federal research funding over four years. There’s still time to participate: Contact gicr@utoronto.ca if you would like cards sent to you by Thursday, Dec. 14. They require no postage and should be dropped into the nearest Canada Post box before the holidays. In the final push for the U of T postcard campaign before the holiday break, the University of Toronto Students’ Union is kicking into high gear student involvement in the campaign by stocking the postcards at their UTSU’s Got You exam de-stressor tables. From now until Dec. 19, students can drop by the tables for a healthy snack, fun activities, and to sign a postcard, said UTSU president Mathias Memmel. For a full list of locations and times, see below. The UTSU represents 50,000 full-time undergraduate and professional faculty students at U of T’s downtown Toronto and Mississauga campuses and is part of a coalition of student unions across the country advocating for the report, driven in large part by #Students4TheReport movement led by a team of young dedicated researchers at McGill University. "I think it’s been critical for the [#SupportTheReport] campaign to include and indeed be led by students in particular given they represent the next generation of science in Canada,” said U of T Professor Jim Woodgett, director of research at the Lunenfeld-Tanenbaum Research Institute. Since the blue ribbon panel led by U of T President Emeritus David Naylor released its report last spring, Woodgett has been one of the most active and influential members in the national #SupportTheReport and #Students4TheReport community on social media. 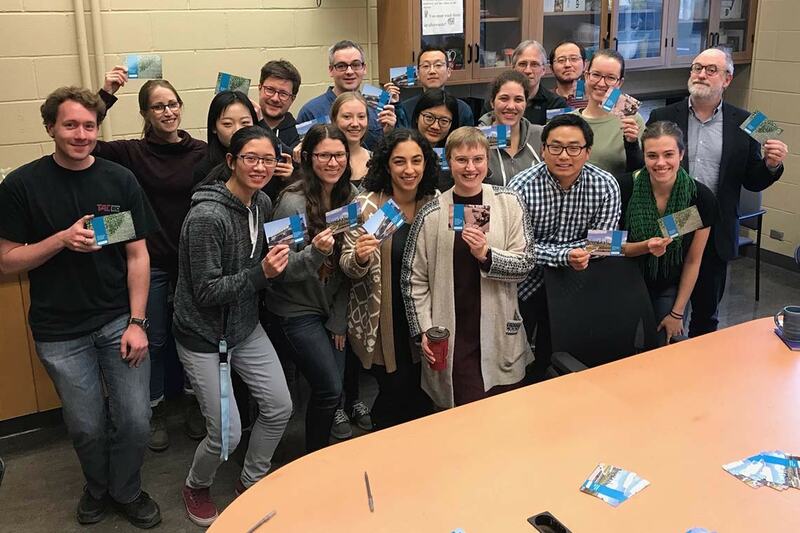 He was among dozens of U of T students and faculty, as well as other researchers from coast to coast, who shared the postcard campaign online, which kicked off with a lab signing challenge issued by University Professor and Ontario's Chief Scientist Molly Shoichet on Nov. 16. “The postcard campaign is a great idea and makes it easy, in a busy world – exam time – for anyone to participate,” said Woodgett, who is distributing them via the institute’s trainee centre. Among the first to answer Shoichet’s signing challenge were young researchers at the labs of U of T’s Peter Roy, Charlie Boone, Radhakrishnan Mahadevan, Alison McGuigan and Michael Sefton. On social media, efforts by U of T students and faculty have gone national and even international, buoyed by the viral sharing of the postcards and videos featuring U of T’s Lewis Kay, winner of the 2017 Canada Gairdner International Award, and Nobel Laureate John Polanyi extolling the importance of supporting curiosity-driven research. One of those changes, announced by Duncan, involves revamping the Canada Research Chairs program to increase diversity, equity and inclusiveness, as well as the creation of a Canada Research Coordinating Committee to improve collaboration among the three federal granting councils and the Canada Foundation for Innovation. For more ways to get involved to #SupportTheReport, visit the U of T advocacy campaign toolkit. The site is a one-stop shop for background on the report, activities happening at U of T and handy ways to share your thoughts with the larger community or amplify the reach of grassroots activities.